Reno Diagnostic Centers (RDC) in Nevada operates two imaging centers in Reno and another in Elko and reads imaging exams from five outside facilities. When Ron Milbank became director of IT for RDC, he wanted to make the organization as efficient as possible. With a background in Silicon Valley, Milbank knew that technology could be used to drive that efficiency. Over the next seven years, every piece of technology—scanners, workstations, internet connections, computers, servers, and software—at RDC was replaced, and the center is now considered one of the most efficient in the country. How did he do it? "We said, 'What's the lowest hanging fruit with the largest return? Because we're going to use that return on investment to fund the other efficiencies,'" Milbank says. Milbank used Lean Six Sigma principles to identify the areas that were most ripe for an overhaul. That meant timing everything that happened in the modalities with stopwatches, optimizing exams for specific magnets, and clustering exams. Every part of the imaging and interpretation process was included in the evaluation. To make exam interpretation more efficient, a universal viewer was implemented. Carestream's Vue platform was chosen, in part because it can read the 13 exam modalities, including digital breast tomosynthesis, that RDC handles. With four radiologists reading 75,000 RDC exams and 50,000 to 60,000 more from the outside facilities each year, Milbank says any time spent walking between workstations is costly. The workstations were custom designed to minimize movement. Milbank says about 20 different keyboard/mouse varieties were tested to determine the best configuration. A high-end gaming mouse and keyboard were chosen; Milbank says the mouse ultimately made the keyboard unnecessary. "Our radiologists' hands never leave the mouse, never leave the microphone," Milbank says. "Every time they have to let go of the mouse or let go of the microphone—the cost of that time of setting it down, picking it up—you multiply that by anywhere from 70 to 125 exams a day. It's the same thing with clicking—every mouse click, every time you have to move your mouse from one monitor to another monitor—we looked at all of those variables." An 8-core workstation processor was chosen to optimize PACS and RIS software capabilities. To enhance communications between the PACS and RIS, Milbank made sure the body parts table of each system is perfectly matched. He says this avoids having exams sent to the PACS correction worklist. The HL7 connections between the PACS and RIS are also optimized to maintain data speed and avoid timeouts. The workstations hold 19 months' worth of images. Primary storage consists of a storage area network (SAN) using solid-state drive chips. Current and prior year studies are available in one to two seconds. Older files are stored on a SAN with spinning drives. Rather than use individual servers for the different centers, a virtual machine (VM) environment was created to serve all of the centers. To connect the hardware, Milbank chose 10GB copper wire, rather than fiber cable, for cost savings. He says the connections are doubled to get about 18GB from the VM environment to the SANs. "When you do the math and you see the time savings you get from that, the hardware pays for itself in much less than three years and, in some cases, less than a year," Milbank says. Each radiologist's workstation has an 8-megapixel monitor from Eizo in the center and a 36-inch 4.4-megapixel Samsung display on either side of the central monitor. The RIS, which has M*Modal dictation software embedded, is located on the right side; there is no separate monitor for dictation. Milbank says this reduces radiologists' eye movement, since there's no need to switch between the RIS screen and a dictation screen. Although different types of studies may display different information, all hanging protocols are the same. Radiologists are able to click through without having to look at the RIS. 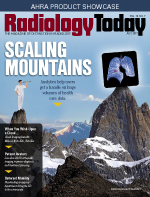 Milbank says the protocol standardization required buy-in from the radiologists. "We got the radiologists together and said, 'Look, in order to be efficient, ensure we're doing things consistently, and have the ability to measure what's going on, you need to compromise for the benefit of efficiency.' And they bought it," Milbank says. "I can see how it might be hard to do that with 40 people but with four or five it's pretty easy, once they ideologically understand that in a world of declining reimbursement, efficiency is the only way to ensure the business has the capital to continue to invest in newer technologies and newer scanners." To that end, RDC also invested in a new MRI scanner, even though the old one was only 3 1/2 years old. Milbank says the expense was justified by the realization that RDC could do an additional nine scans per day, running six or seven days a week. The organization now has 1.5T and 3T Siemens scanners, which allow them to more evenly divide exams between the two magnets. Milbank says this configuration provides not only improved workflow but also training benefits. "They both run the same version of Siemens software, even though they're two different magnets at two different field strengths, which means my training impact to my MRI techs goes to zero," Milbank says. "If they can run one magnet, they can run the other. It looks and feels the same." RDC also looked at exam scheduling to reduce unused equipment time. Milbank says clustering exam types greatly improves workflow efficiency. For example, performing three neck MRI studies in a row, rather than going from a neck study to a knee study and back to a neck study, can save 10 minutes. Over time, those savings add up. When it comes to technology outside of an organization's core business, Milbank recommends a similarly comprehensive view. Although technology is an expense, a carefully considered plan can increase revenue over and above the initial cost. "So many doctors' offices—and it isn't just radiology groups, it's kind of global across the industry—get hung up on the cost of ancillary technology, which is anything other than the modalities or the PACS or the RIS. And every one of my employee workstations has two monitors. Every one of them has a computer that's less than four years old with the fastest processor we could buy at the time," Milbank says. "The ideology is to allow the equipment to drive the efficiency. It's a 50/50 proposition. The modality activity has to be efficient, but the technology has to provide the speed to keep up. And driving that home to people to not get hung up on the cost [is important] because it pays for itself fivefold."